Handmade dimpled cup with a matt white glaze on the outside and soft coloured inside. Available in pale blue, pale pink, grey and turquoise. Handmade by Linda Bloomfield in London. This handmade dimpled ceramic vase is a lovely addition to a nature loving home. Placed near a window, the delicate almost dawn coloured glazes complement the light outside. A lovely gift any time of year. 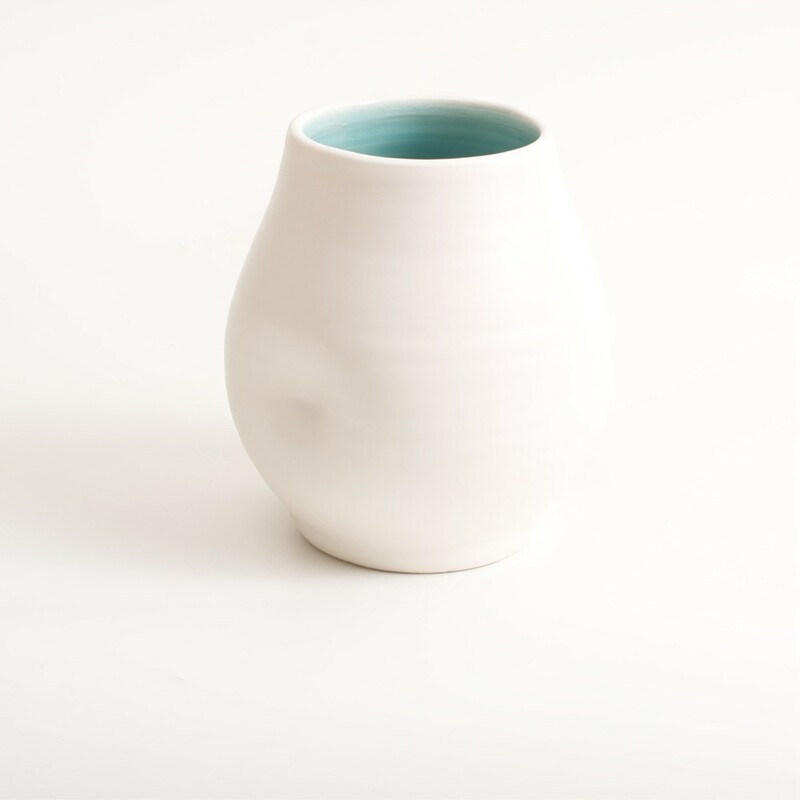 The vase is hand thrown by Linda Bloomfield in her west London studio. She adds the dimples while the clay is still soft, before glazing. It has a satin matt glaze on the outside and an optional subtly coloured inside. Choose between turquoise or pale blue. ELLE DECO has featured Linda Bloomfield’s popular dimpled range, and it’s also popular among stylists and bloggers. Match with more in this tactile series, including the Dimpled jug and cups. See all Linda Bloomfield’s products here. Flower press in screen printed wood. This pretty flower pressing kit is practical and portable, perfect for outings with young and old. Handmade matt white porcelain plate, available in two sizes. Hand thrown in England. Dishwasher safe. Copper water bottle with benefits like antioxidant, anti-inflammatory and anti-microbial properties. Polished hammered copper "Athlete" bottle (850ml). Wide mouth for easy drinking and adding ice cubes for sports or use on a hot day. Silicon seal prevents leaks.